Memphis Depay is a name on everybody’s lips after he showed himself to be one of the brightest talents in football at this summer’s World Cup with two goals and one assist. During the tournament he became the youngest Dutch player to score at a World Cup at the age of just 20. He was nominated for the best young player of the tournament award, but was beaten to the accolade by Paul Pogba, but it’s clear that Depay is one of the most exciting young players in the world. It’s not surprising that he has been linked with a move to England as Tottenham and Manchester United have both been linked, but it is believed it would take a fee upwards of £15m to get him, with PSV keen not to miss out on a big pay day for the player that needed a lot of development, especially when it came to the mental side of the game. Although he is now known by some as the ‘Dutch Cristiano Ronaldo’, he had a lot of problems in his teenage years. 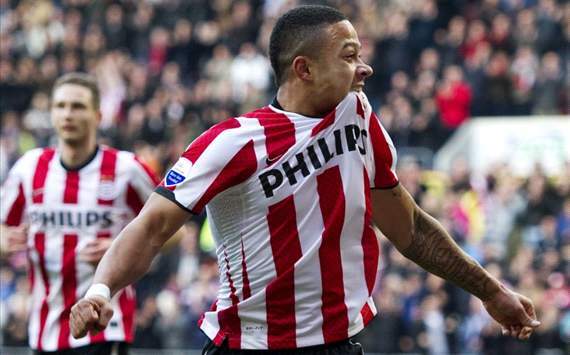 He was a complicated child and was designated a life coach by PSV, who referred to Depay as ‘very angry’. The World Cup star struggled to adapt to the set up at the Dutch club, mainly due to his problems with authority. This developed from the problems he went through with his parents, who divorced when the winger was only four years of age, causing a great deal of emotional stress. It remains evident to this day as he wears ‘Memphis’ on the back of his shirt as he doesn’t feel a connection with his father or his name. Every great footballer normally has a troubling story and Depay is no different. He overcame his personal issues to focus on football, and featured for Holland in several age groups, highlighting how he was always ahead of children of the same age when it came down to ability. In 2011, he was part of the under 17 side which won the European U17 Championship, scoring in the final. His experience at youth tournaments will have helped him a lot this summer when he excelled at his first senior tournament and nobody would doubt his ability to shine at more major tournaments in the future. He is often seen as a character who sometimes becomes over confident and even cocky when it comes to his own ability, but self belief is crucial in reaching the top of the game, and that is exactly where Depay is headed. Depay was only 17 when he made his PSV debut in the Dutch Cup during an 8-0 demolition of WSB Noordwijkerhout, making his name with two goals. Yet he didn’t make his Eredivisie debut until he was a year older, making a cameo appearance against Feyenoord in 2012. His first league goal came against Heerenveen in a 5-1 victory, despite only being brought on for the closing stages of the match. It was clear he was going to become a key player for PSV very quickly, playing in 20 league matches during the 2012-13 season, but it was last season that he became a consistent starter, featuring in 32 matches. After establishing himself at PSV, he quickly became one of the best players in the Eredivisie. Last season he netted 12 goals and managed to get 7 assists, while he also managed to score his first ever European goal. This summer saw him add his first international goal against Australia in a very nervy match for the Dutch, clearly showing his determined character. He wasn’t struck down by nerves, which happens to a lot of established players at international tournaments, let alone young players finding their way in the game. It’s clear Depay is only going one way and he may need to leave the Eredivisie to achieve his goals, the only question is whether that will be this summer, or at a later date. For those who are unfamiliar with Depay, he is a player who can play all across the attacking positions, but it best suited to playing wide left. He is somebody who likes to dribble with the ball and has excellent ball control. His pace is crucial to his game as he can often use it to beat defenders of to make runs in behind the opposition defence, while he is also very skillful which makes him difficult to defend against. Depay is most dangerous from range as he has a terrific long shot, which resulted in a lot of goals last season. He is equally dangerous from free kicks. His main weakness is his decision making as he can often shoot when he has better options around him, but that is a trait common in young players and it will start to fade with experience. It’s is unquestionable that the Dutch international is an exciting talent, whose reputation has been enhanced after his impressive performances at the World Cup, but it would be a gamble for a side to pay a big transfer fee for him. He has only had one full season as a first team regular and still has a lot to develop, in order to become a consistently good performer. It may be in his best interest to remain in the Eredivisie for another season to develop further, before making the move to a bigger league. It would do him no good to make a move to early and stagnate on the bench at a club like Tottenham who have a lot of attacking talent. A move to Manchester United may be perfect as he will be working with a manager he knows and the competition will be less fierce. He clearly has the right character to progress in the game, but a young player relies a lot on timing when it comes to his first big move. Is this summer the right time to leave for pastures new? The jury is out on that one.